Athletics connect universities with their communities and fosters healthier, better educated citizens. Todd Pettigrew in his recent opinion article in University Affairs argues that universities should get rid of varsity sport. As a former varsity athlete and current faculty member who remains engaged in and supportive of sport at universities, I am responding with some of the reasons why I disagree with his position. First, arguments that university sport is too expensive are really ancillary to the main argument: the author does not believe universities should have varsity sport at all. “Expensive” is relative – if you want to do something, and do it well, then you fund it at an appropriate level. 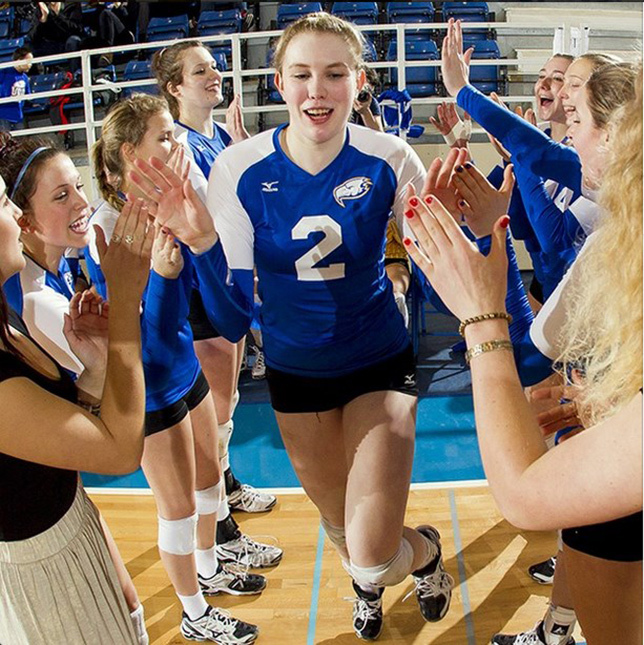 UBC women’s volleyball player Lisa Barclay has been named the Canada West Female Athlete of the Year. Photo courtesy of the UBC Thunderbird’s Instagram feed. In fact, it is widely recognized that university sport in Canada is vastly under-supported financially. There is no better evidence than the students who are voting with their feet: approximately 4,000 Canadian students flocked to universities in the U.S. in 2012-13 because the sporting side of their talent is not supported well enough in Canada for the level of their athletic ambitions, along with their academic aspirations. The roughly 11,000 varsity athletes in Canadian Interuniversity Sport (CIS) who stay home to participate would be the prime casualties of Professor Pettigrew’s call to eliminate varsity sport. Some talented athletes have the opportunity to pursue their sport through a club or professional-based system, as is the case with men’s hockey in Canada, baseball in the U.S., and most sports in much of the world outside the U.S. and Canadian university systems. But where both paths are available – club/professional or university – more multi-talented students than ever before are choosing to pursue both academic ambitions and sport – that is, the opportunity to be more well-rounded and healthy people. Many of these are among our most stellar academic performers who often add so much to a classroom, campus and community. Varsity sport also pushes other young people to raise their academic performance so that they can continue their sport at the next highest level. Everyone in the sports community has examples of students who would not have continued their education without this opportunity, yet many of them go on to achieve a degree and all the subsequent benefits. Nor does Dr. Pettigrew factor in the abundance of community, business, academic and other leaders in our society who themselves benefited greatly from the opportunity to pursue competitive sport in university. They are everywhere, including in corporate boards and government, where plenty of MPs and even our Governor General are former university athletes. Many in turn give back to our communities by serving as community and school coaches who pass along their enthusiasm and sport expertise gained in university. The concern that Dr. Pettigrew voices about scandals has to be weighed against the benefits of varsity sport, which he ignores. One also needs to ask whether there’s something systemic about students who are varsity athletes or is there something systemic in the structure of university sport that fosters an unacceptable rate of misconduct. Without excusing unacceptable behavior, we are far from such a chronic structural problem in Canada as the powerful dynamics driving scandals among U.S. universities chasing billion-dollar media contracts. Still, the experience of American universities offers a salutary lesson that Canadian university presidents have recently committed to avoid while still affirming the value of pursuing excellence in university sport. The real question is: what value is there in having sports in the context of postsecondary education? We have competitive sports in high schools after all, and 55 universities today in Canada agree that competitive sport belongs in the university setting. Why? On the financial side, Dr. Pettigrew’s simplistic accounting doesn’t add up. He omits the revenue that some athletics programs generate; some athletics departments even operate as independent, ancillary units and thus have not used any university resources that could otherwise have been devoted to faculty salaries. Athletic programs are also substantially funded by dedicated sources such as student fees. Research has also shown that athletic alumni give back to their alma mater at higher rates than non-varsity alumni (at three times the rate for one of Canada’s largest universities). Moreover, those alumni give not just to athletics but also to academic programs, scholarships, and other supports for which alumni are increasingly vital in an environment of ever-shrinking government support. Research and learning are intensified in numerous ways on our campuses through the presence of elite-level student athletes. Internships are offered where students can practise athletic training, sports medicine, event management, marketing, nutrition, and sport psychology, to name a few. People who compete in sports typically possess qualities – being organized, team players and leaders – that are coveted by employers. Under Dr. Pettigrew’s proposal, universities would also become less engaged in their communities, as varsity teams and students constantly take on a wide variety of community outreach, charity, coaching and mentoring. Sport often provides these students with international experience, as well, enhancing the reputation of their university. At the 2012 Olympics in London, all Canadian swimming Olympians who were in university had trained in CIS universities – quite a global branding opportunity for any university. Faculty and graduate students have long availed themselves of opportunities to engage in research with varsity subjects on campus. One example is studies in brain processing of hand-eye coordination that are tested with varsity athletes. Faculty in Canadian medical schools are sometimes asked to participate as Canadian national team staff for international competitions like the Olympics. Universities and sports institutes are forging relationships to do research on concussion resistance, human endurance and performance technologies. Why shouldn’t our universities be at the forefront of knowledge and practice of such a powerful force in our society, one that moves so many people and often for their entire lives? For students who often report in university surveys that they don’t feel connected to the community, athletic competitions are one way to build a sense of belonging. Sport has benefits for cognitive performance as well as other obvious health benefits. Varsity athletes also offer inspiration for others to take part in healthy sport at a time when some say Canada is experiencing an epidemic of obesity and related health problems. All told, Dr. Pettigrew advocates for a less healthy and less educated society. His vision would lead to a less-engaged university that’s a lot less fun for some 11,000 of our most ambitious students seeking their highest achievement in multiple talents – not to mention for those of us who enjoy supporting them. Dr. Price is professor of political science and senior adviser to the president of the University of British Columbia. He played varsity basketball while studying at the University of Alberta. Well said…as my son moves south, to small-town Oklahoma, with a golf scholarship. When there is money to do it well, I would agree (as a one time student athlete myself) that athletics add a great deal to campus life. These days, however, the question has become “Should there be an athletic program, or a (insert your favourite discipline here) program?”. In the specific example I am thinking of, more students were affected by the decision to suspend two programs indefinitely than are on the combined athletic squads of the school. It is a shame that some of our brightest and most driven athletes to the U.S. system, but, by the same token, many Canadian grads are leaving to go the U.S. for post-graduate training. Ultimately, you get what you pay for. We cannot expect our underfunded programs to compete effectively – in any area. In the U.S., the student pays. Here, the public (which ultimately benefits) used to help out more but provincial governments are lacking/redistributing funds and cracks are starting to show. I tried to find out the athletics budgets of post secondaries in Calgary–and one cannot get those figures. Unlike universities in Canada and United States, our post secondaries are not required to disclose financial and many hold on to them like state secrets. This system must change if it expects sport to be supported by faculty and or the public. I am a former varsity athlete but I think the system of secrecy undermines the credibility and goal of varsity sport.